Wedding bells rang out at Wangkatjunka when Tony and Audrey decided to marry after coming back to the Lord at a recent Christian convention. 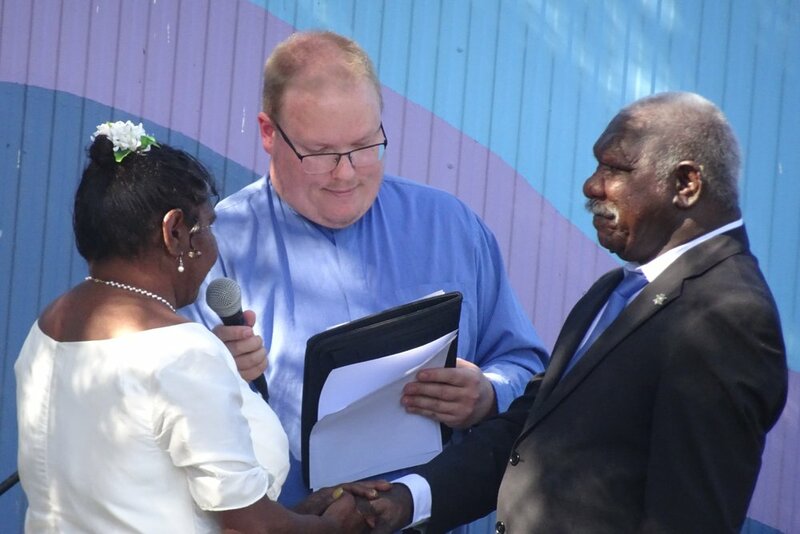 “They wanted to bring their lives into line with God’s word in all sorts of ways,” said Broome Minister-in-Charge Michael Baines, who had the joy of helping them tie the knot. The joyful occasion brought together the whole community of about 280 people who live some nine hours’ drive east of Broome. Michael explains that Broome Anglican parish has two services, a morning gathering and an evening indigenous service called the Broome People’s Church. The parish enjoys a growing partnership with the brothers and sisters at Wangkatjunka People’s Church. Members from Broome have also helped repair the remote church building to make it suitable for meetings.